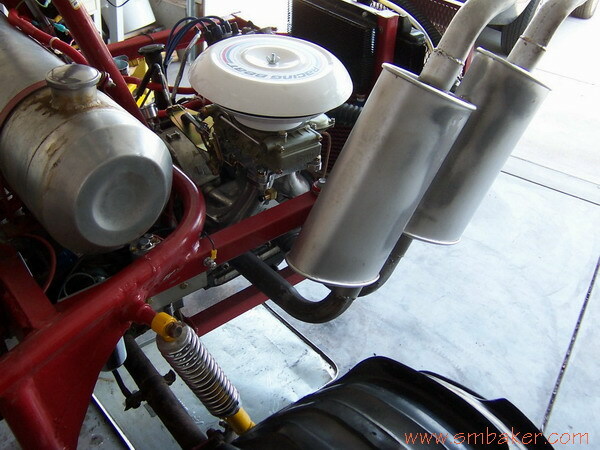 The first picture shows the new carb kit as installed on the engine, in the sandrail. You can’t really see that much detail in the picture, but you can see the new white air cleaner which is included with the kit. Attaching throttle linkages, oil injection, choke heater tube, etc. Racing Beat supplies a custom throttle linkage that will mate to the existing rx-7 throttle cable, and a custom oil metering pump linkage that connects the oil metering pump to the carb. The oil injection setup is slightly different with the holley than with the stock carb. Rather than inject the oil directly into the carb barrels as the stock carb does, the holley kit injects the oil into the primary float bowls. Both of the oil injection lines are Tee’d together and feed into the primary bowl, where the oil mixes with the gas. I’m not sure I like this solution, but it does seem like a reasonable compromise. The kit is very much a bolt-together kit. There is little or no fabrication required. As delivered, the kit was properly tuned and jetted for my application, so there was no need to get inside the carb. The only tuning necessary was to check the float levels by looking in the float bowl inspection ports, and to set the idle mixture and speed. Since my stock carb ran kind of crappy, I wasn’t able to make a good comparison of the performance increase of the new kit. There’s a famous saying that the “greatest increase in performance is when you go from not-working to working“, and that’s pretty much the situation that I was in. I will try to write down a few notes about how the sandrail is performing. Starting. The sandrail is still a bit difficult to start. I am going to write the starting problem off to using a stock 12V vw starter, which doesn’t spin the engine quite fast enough to give it a good start. The kennedy people recommended using a 6V starter at 12V to get the mazda engine to spin up faster, but I went with the 12V setup, which is known to be a bit more difficult to start, but also a bit easier on the starter. Usually I give it a couple of good pumps with the accellerator, and it will fire up without too much trouble. Low-RPM performance. Low-RPM performance is acceptable, but nothing to get real excited about. I find that you have to be pretty aggressive on the accellerator when starting off from a full stop to keep from stalling when you shift into first. Part of the problem is due to the Sandrail’s transmission, which I don’t think is setup quite right for such a high-rpm engine. I think changing to a 4.86:1 ring and pinion (right now, I have a 4.12:1) would probably help. Where I used to be able to plod along at about 2500 rpm in second with the VW engine, the Mazda engine isn’t very happy. It much rather prefers to be running at 3000+ rpm. High-RPM performance. The sandrail is able to go about as fast as the driver is willing (or foolish enough) to drive it. I’ve had the sandrail up to 65-70mph in second gear, which is where the frame starts to vibrate and the front end starts to pick up, and you start to lose steering ability. I’m not crazy enough to go any faster than that on sand. I find that I spend much of my time in first gear — first makes an all around good gear to run around in. First gear is useful up to about 6000-7000 rpm which will take you to a good 40-50 mph. Second gear is useful for when you want to go faster, and I find that it works well if you want to go a minimum of 25 mph. Third gear isn’t really that useful. It would be useful if you wanted to go really fast, but you don’t want to try that in a Sandrail. Fourth is completely useless, as it is on most transaxles. This is with a mostly-stock transaxle with 4.12:1 rack&pinion. Overall, I like the kit. 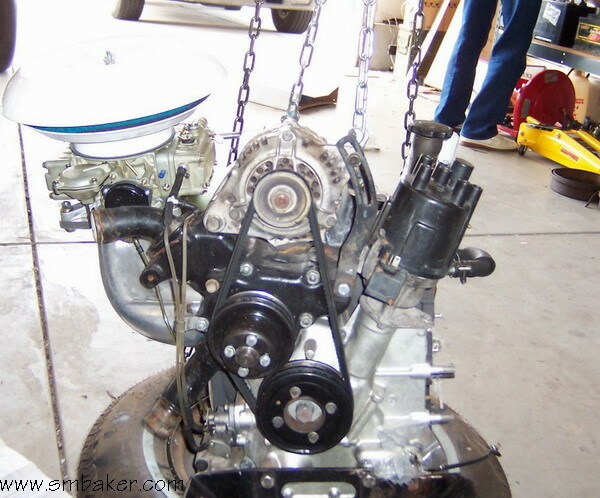 You get a nice new clean holley carb, and everything is very easy to install. It’s definitely something the average person should have no trouble getting installed and up and running.